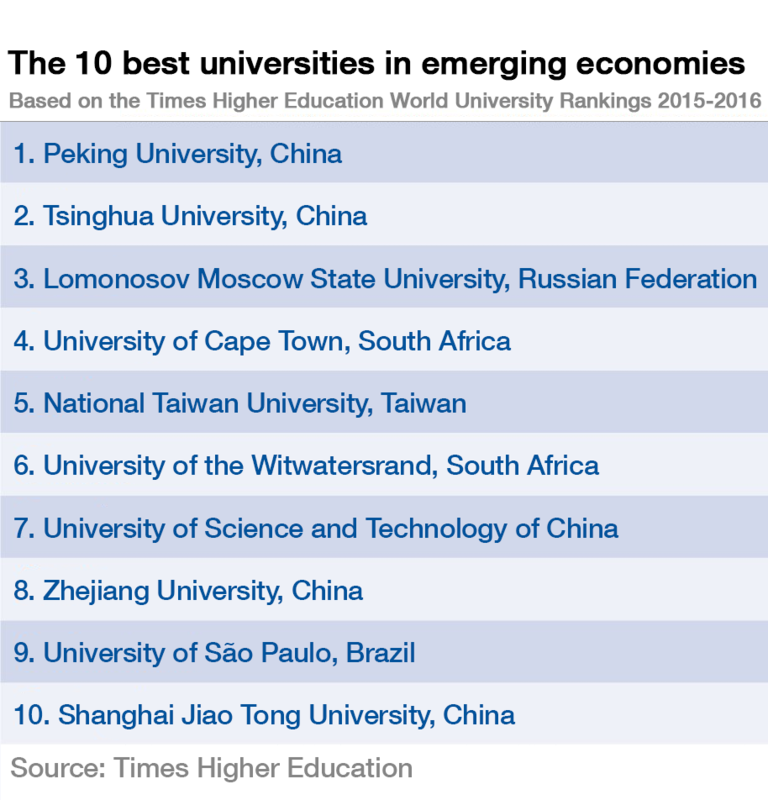 China dominates the rankings for top 10 universities in emerging economies, according to the Times Higher Education World University Rankings 2015-2016. Half of the top 10 universities, including the leading two, are based in China, with institutions in South Africa, Russia, Taiwan and Brazil also featuring. The rankings assess the performance of universities across the world based on five key areas: teaching, research, citations, international outlook and industry income. The weightings are adjusted to reflect the characteristics of emerging economy universities. Peking University in Beijing takes the first spot, with an overall ranking of 73.8. The university finished in 42nd place on the world university rankings. China’s dominance of the 2016 rankings reflects the nation’s plans to develop its universities. China’s World Class 2.0 scheme aims to establish six universities in the leading group of global institutions by 2020. Other BRICS nations have also performed well. Lomonosov Moscow State University comes third, the highest ranked of 15 Russian institutions in the top 200. Only six South African universities are featured in the top 200, but two are placed in the top 10. Brazil has 14 universities on the list, with its highest ranked, the University of São Paulo, placed 9th. India is the only BRICS nation without an institution in the top 10. Its highest ranking university, The Indian Institute of Science, comes in at 16th. A total of 35 emerging economies feature in the top 200, with 16 countries featuring for the first time, including Greece, Nigeria, Kenya and Romania. These additions may be due to the inclusion of countries defined by FTSE as “frontier economies”, as well as “advanced emerging” and “secondary emerging”. The full Times Higher Education World University Rankings includes 800 universities from 70 countries and is available here .